Finally, a Gratin | I made that! I’ve been searching for this recipe for quite a while now. A gratin. A great dish. A great word. Grataaaaaaaannnn… I could repeat it many, many times without getting bored. Maybe I should get a more interesting life? But anyways, the point is that gratin should be easy enough. When I imagine it, it’s just like in Ratatouille, where I effortlessly slice some veggies and toss them into a shallow dish with a little cheese and herbs. A quick trip in the oven later and out comes a beautiful summer dinner. Somehow though, mine never go that way. They’re always too “something”: too watery, too heavy, too oily, too bland. I had all but given up on the gratin until I happened upon this recipe. 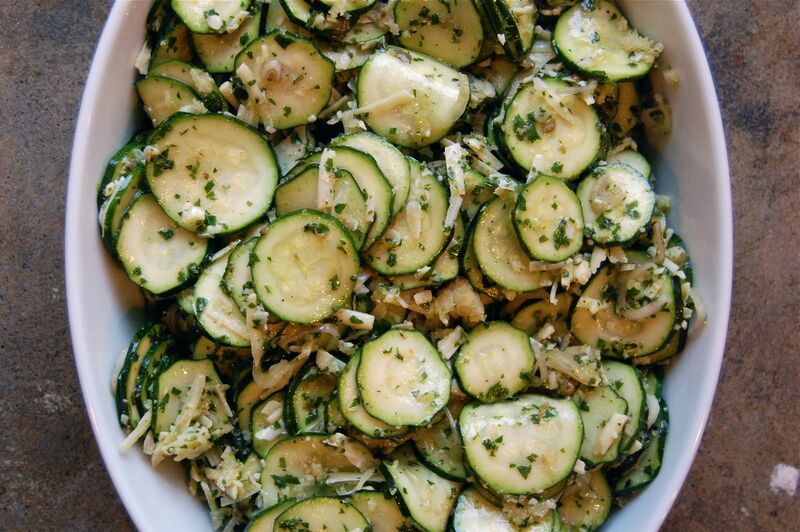 The photo made me so hungry that I actually placed a zucchini gratin on the menu for a class I’m teaching at The Pantry because THEN I would HAVE to recipe-test it to perfection. Oh my friends, summer just got better. For me anyways. What better way to use up the mountain of summer squash growing in your garden than with trays and trays of crispy, cheese-laden, buttery breadcrumbed gratin? Sure, this wasn’t as easy-peasy as the gratin in my fantasies, but it certainly was as tasty. I started by salting some thinly sliced zucchini until it released all of its water. Then I got to work on the magic herby sauce that I would eventually toss the zucchini in. And browned butter, did I mention that there was browned butter involved? It gets tossed into fresh breadcrumbs to make a nutty slice of heaven. Everything got tossed together with some gruyere. And baked until it was nicely browned and crispy. And then yes, me and my good friend Merriss ate it straight out of the pan. There were some burned mouths by the end, but we didn’t really care. We were in a gratin coma. I made a few changes to the original recipe: more cheese, slightly less oil and shallots, and a lot more lemon juice. I left out the jalapeno, which I know is a bit weird for me, but I really wanted the zucchini to have center stage on this one. – Heat the oven to 400 degrees. Cut the squash into 1/8-inch-thick slices. 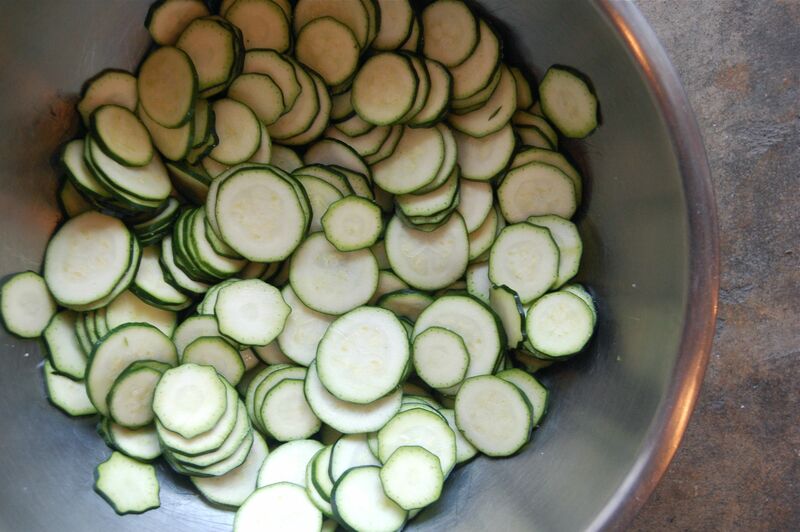 Toss the slices in a large bowl with 1 teaspoon kosher salt, and let sit for 30 minutes. 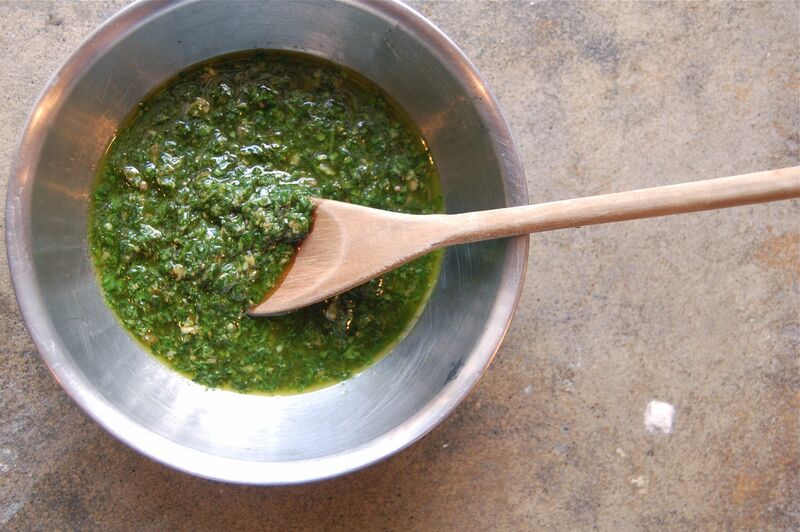 – Meanwhile, using a food processor, grind the herbs, garlic and anchovies and half of the oil to a paste. Transfer the mixture to a bowl. – Gently pound the capers until they’re partially crushed and add them to the herbs. Stir in the remaining oil, the lemon juice, salt and black pepper. Taste for balance and seasoning. 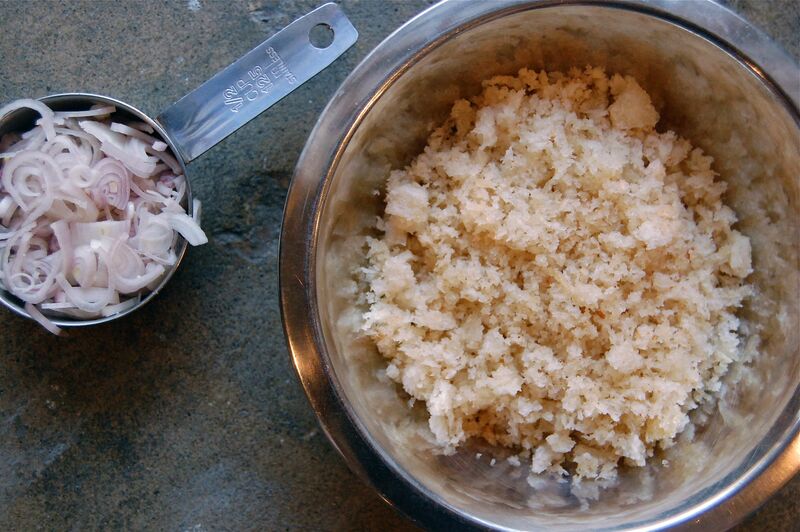 – Place the breadcrumbs in a bowl. Heat the butter in a small saute pan over medium heat for a few minutes, until it browns and smells nutty. Pour the brown butter over the breadcrumbs, being sure to scrape all the brown bits into the bowl with a rubber spatula. Wait a minute or so for the butter to cool, and toss well. Set aside. – Drain the squash well and transfer it to a large mixing bowl. Add the shallots, minced garlic, thyme, 1/2 cup of the salsa verde, and some pepper. Toss to combine, and add the cheese and half the butter-coated breadcrumbs. Toss again, and taste for seasoning. – Place the squash in a 9-by-9-inch gratin dish. Scatter the remaining breadcrumbs over the top, and bake 40 to 45 minutes, until the squash is tender and the top is crisp. « I Totally Made That. I made a zuchinni-rice-cheesy gratin and it was fantastic! A hit! The best office lunch of 2010!!! Thanks for reminding me of it, ti really was one of those just-throw-it-in-the-pan-and-add-a-load-of-cheese gratins. Zero effort, and I think the addition of rice to soak up the sauces was genius. I must make it again, and your gratin too of course! This sounds so yummy! Thanks for sharing the recipe. I will add zucchini to my farmer’s market shopping list..
I’ve missed your posts! Glad to have you back! Your posts make me happy. Thanks for giving me something delicious to do with all my zucchini! Great idea — I’ll have to use my next batch from the CSA for this one. oh I am SOOOO making this within the week! Mmmm! Sounds great! I love your blog and can’t wait to try this! Thanks for another great post for using fresh, seasonal veggies. Casseroles and gratins = my favorite things ever. Looks SO GOOD! 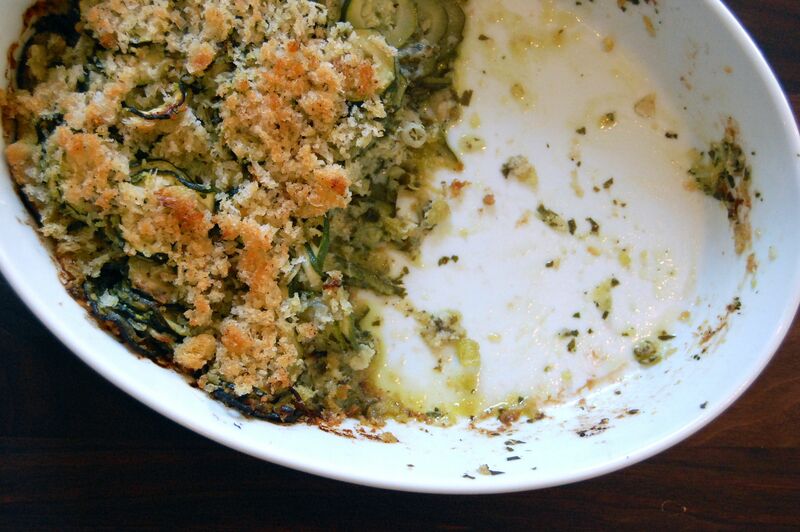 I LOVE this idea of a summer gratin. I could devour the entire dish if left to my own devices. nice work – I will soon follow suit! This looks delicious! 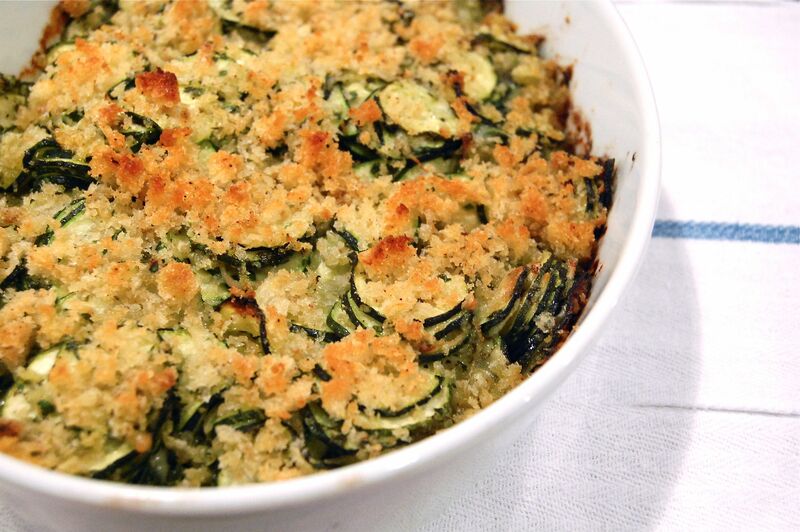 I made a gratin using grated zucchini before and it tasted pretty good. I’m going to try it with sliced zucchini next time. Can’t wait to make this tonight!!! If I make extra salsa verde, how long will it last in the fridge? Also, any fun ideas for other uses? Yum! I’m going to the kitchen to see if I have everything to make this right now! I was wondering if I could use my stocked pesto sauce as an alternative to the salsa verde? Would that work too? Oh snap, this looks insanely delicious. I’ll have to give this one a go. Thanks Brandi. wow i will definitely try that out sometimes soon. Just made this but hast replace a few things-for the salsa verde I used thyme basil and oregano, so I left outthethyme in the zucchini mix. I didn’t have any anchovies so I left that out. It was deeeeeliciouuuus and I am having trouble not eating what’s left right this second! thanks for this. I’m going through courgettes like there’s no tomorrow at the moment, and I’m getting a little bit tired of the same recipes. Will try this recipe out! DROOL. Hi! I just made an awesome zucchini gratin with APPLE in it. It was a random kitchen event based on what was in the refrigerator and it was amazing. It’s at http://www.eggton.com if it’s of interest. But I believe I will make this one next, because it sounds so savory with all those salty-delicious ingredients, like capers and anchovies. Yum. I saw this recipe posted on Pinterest. I modified it (no onions! different spices, had to use fontina/parm cheese) but it was sooooooo yummy! It was great because my garden produces zucchini in obscene quantities. Wow! What a fab recipe! I finally know what to do with all the zucchini in the garden!